Great brands are great because they stay laser focused on what they do best. Our passion and our skill is helping those brands shine in the digital world. Everyone who works here is the very best in their field, and they love working collaboratively-with each other and with our clients-to deliver consistent excellence. We don't do cookie cutter design and development. We approach every project with fresh eyes (and ears) and take a rigorous, yet open-minded path to the right solution. Our work wins big awards, but for us, the long list of clients who hire us again and again is a far more valuable indicator of the quality of our work. Award-winning work for adventurous tech startups, established industry titans, and everything in between. We've been designing and building Scion's car configurators for years, and recently, we were hired again to create a mobile way to Build Your Scion. The solution we crafted is an elegant interface that translates the desktop experience flawlessly to a smartphone. 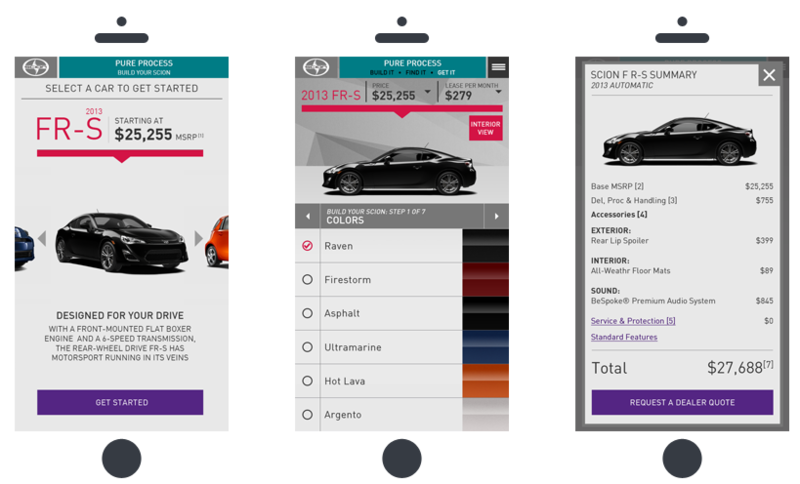 It allows users to immediately play with Scion vehicle configurations-without the barrier of an app download-and is playing a crucial role in generating more dealer leads. We take a holistic, big-picture approach to every project, and because we're masters of many skillsets, working together seamlessly, we get there more efficiently and effectively than pretty much anybody. We analyze everything about a project-product roadmap, operational needs-and create a solution that works. We're not obsessed with the latest and greatest platform, unless, of course, it's exactly what a project needs. Our designs are objectively beautiful-our Webby and other awards prove that-but we don't do cool for cool's sake. We design in a way that feels instinctively right to the user from the very first touch. Server side. Web client. Native mobile. Our development chops are rock solid. But with over 100 very large projects under our belt, we're also experts at integration, a crucial skill that can make or break a project. We can build the perfect site, but without good maintenance, it won't live up to its true potential. That's why we have a crackerjack team of development-savvy pros working in house to keep our clients' sites as sparkling fresh as the day they launched. Tight teams. Great Energy. Transcendent work. Our studio is an incubator for awesome. Think we'd make a good match? Get in touch. DHAP DIGITAL, INC. IS LOCATED IN POTRERO HILL, WITH EASY ACCESS TO SFO AIRPORT, 101 AND 280 FREEWAYS, AND PUBLIC TRANSIT.